The Super Battle Droid is a Star Wars minifigure. It is an advanced version of the standard B1 Battle Droid. The Super Battle Droid stands taller than most other minifigures. It consists of a single piece for the torso, a single piece for the legs and two parts for the arms. All sections but the leg part are exclusive to the minifigure, as its unique design cannot be matched by standard components. Three variants were made, each one differing very slightly from the last. The first Super Battle Droid was released in 2002 and was accurately coloured metallic pearl blue. The torso is large and wedge-shaped with four horizontal grooves, one above the other, on the lower half. The upper half is smooth and slightly rounded and is where the head is located. 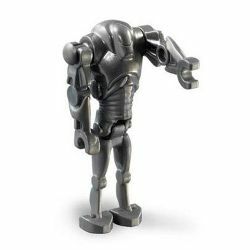 The head does not stick out or protrude like minifigure or normal battle droid heads; rather, it is set at shoulder level, with no neck. Two slightly raised sections of the shoulders fortify the sides of the head. The arms are identical and have two grips, one one each side, with a circular section representing a hinge near the middle. This immobile "hinge" is closer to one end than the other, depicting a shorter upper arm than the forearm. The forearm is narrow near the front grip and gets wider as it gets closer to the hinge. A small tube is located on the arm, representing the arm-mounted repeating blaster the super battle droids are equipped with. The legs and feet are made up of one piece and are, like the torso, accurate to the movie. The legs appear thin from the front, have square-like calves and have one joint at the knee. The feet are connected at the bottom and the knee joints are immobile, however, allowing for only the limited movement of bending over nearly not 90 degrees. The second variant was released in 2007 and differs from the original in one way: while the first version was metallic pearl blue, this one is metallic dark grey. The third and as of yet last version released was introduced in 2009. This, too, is similar to its predecessor. The difference is in the left arm: instead of the standard with a small blaster, the forearm is the gun. At the elbow joint the arm becomes cylindrical and extends farther than the other one in a representation of the rocket launcher some unique super battle droids possess. In the Gameboy Advance version of LEGO Star Wars: The Video Game, a form of the Super Battle Droid is present in the game, which is based on the physical variants without a rocket launcher arm, but green instead of blue or grey. For console versions of LEGO Star Wars: The Video Game, as well as for LEGO Star Wars II: The Original Trilogy and LEGO Star Wars: The Complete Saga, the Super Battle Droid is a based on the Super Battle Droid's first physical variant. It has the ability to shoot, however it is unable to jump. If the "Self Destruct" extra is activiated by purchasing its corresponding power brick, the droid also has the ability to blow itself up. The Super Battle Droid returns in LEGO Star Wars III: The Clone Wars as a grey version, and retains its abilities from the previous games. Also in LEGO Star Wars III: The Clone Wars, golden versions can be found throughout levels, called "Golden Super Battle Droids". Once these droids are built in the level, they can assist the player throughout the mission. B2 Super Battle Droids were a key part of the CIS military. They were specialized battle droids encased in thick shells of armour and equipped with heavy weapons. Their strong, bulky exterior which made them difficult to take down. That, coupled with their wrist-mounted repeating blasters and missile launchers, made them extremely valuable on the battlefield. It also made them rather expensive to create, which is why they were never mass-produced like the B1s. Unlike their less powerful counterparts, which often served other functions like that of a pilot, B2s were designed for combat and nothing else. They rarely, if ever, spoke. B2s marched on the front lines, often acting as shields for the B1s behind them. They were known to destroy everything in their path, including other droids, to reach and destroy their quarry. They were occasionally painted in camouflage for dense jungle planets and were sometimes modified to carry heavy missile launchers. Super Battle Droids, in their efficiency, were used from the start of the Clone Wars to the end. Facts about "Super Battle Droid"
This page was last edited on 10 August 2016, at 11:13.